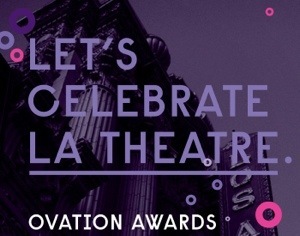 The LA STAGE Alliance Ovation Awards, celebrating theatrical excellence and achievement during the 2012 season, were presented on Monday, November 12, at the Los Angeles Theatre in downtown Los Angeles. Hairspray; and Man of La Mancha). The Antaeus Company (Peace In Our Time), and Theatre @ Boston Court (The Children) took home two awards each. For a complete list of winners, visit www.LASTAGEOvations.com. compassion that LA STAGE has dedicated to the performing arts in the City of Los Angeles. Monique L’Heureaux, Sarah Lyding, Lesli Margherita, Gates McFadden, Jessica Wethington McLean, Laura Penn, Assembly Speaker John Perez, Bill Rauch, Allison Rawlings, Mark Roberts, Kirsten Vangsness, Ken Werther, Vanessa Williams, and Charlayne Woodard. LA STAGE Alliance is dedicated to building awareness, appreciation and support for the performing arts in Greater Los Angeles through community building, collaborative marketing/ audience development, professional development to strengthen the sector, and advocacy. Providing access to the performing arts for patrons and access to information and resources for organizations has been the mission of the Alliance for over 35 years. The Alliance connects artists and arts administrators from over 500 groups annually in a six county region with opportunities to engage, inspire, educate and entertain over four million households that engage with the arts in our community. The Alliance engenders a stronger and more connected creative Los Angeles. LA STAGE Alliance programs are sponsored, in part, by Actors Equity, The Angell Foundation, Arts Council for Long Beach, The Biller Family Foundation, California ArtsCouncil, California Community Foundation, City of Los Angeles Department of Cultural Affairs,City of Pasadena Cultural Affairs Division, City of Santa Monica Cultural Affairs Division, Doris Duke Charitable Foundation, ELS, Goldstar, James Irvine Foundation, Andrew Mellon Foundation, Los Angeles County Supervisors through the LA County Arts Commission, MusiCares/Grammy Foundation, National Endowment for the Arts, Ralph M. Parsons Foundation, The Shubert Foundation, Sky Events & Productions, Sony Pictures Entertainment, and Green Hasson Janks.